Your first experience with many of the liberty and leave benefits of military service will typically begin after basic training. However, if your basic training occurs during the Christmas Holidays, you may learn about leave time in the middle of your first few months of military service. During the two weeks around Christmas time, the Army shuts down basic training and AIT schools. Other branches do not allow recruits to have leave or liberty. Recruits are usually allowed to go home on leave at this time if they want, even if it results in going "in the hole" (having a negative leave balance) on their leave balance. Recruits who choose not to take leave at this time, are normally assigned to do details (answer phones, cut the grass, etc), because most of the instructors/drill sergeants will be away on leave, and classes are not conducted during this time. With the exception of the Marine Corps, who authorizes all recruits to take 10 days of leave, immediately following boot camp, one does not normally get their first military leave until they graduate technical school/AIT/A-School. After technical school /AIT /A-School, one is normally authorized to take 10 days of leave if their first assignment is to a stateside base, and 15 days of leave if their first assignment is to an overseas base. (Note: For extremely long schools, longer leaves may be authorized upon graduation). Whether you're the lowest enlisted rank or a 4-Star General (or Admiral), all military personnel get the same amount of vacation time. Military members get 30 days of paid leave per year, earned at the rate of 2.5 days per month. Normal leave is approved/disapproved by the member's immediate supervisor. Emergency leave (someone in your immediate family dies or is seriously ill), is approved by the commander or first sergeant upon verification of the emergency (usually from the Red Cross). Except for emergency leave, and Christmas Exodus, commanders are usually reluctant to approve leave that hasn't been earned yet. This is because, under the law, if a person is discharged (for any reason) and they have a negative leave balance, they must repay the military one day's base pay for each day they are "in the hole" as of the date of the discharge. Leave is calculated according to the fiscal year (1 October to 30 September). One is allowed to carry over only a maximum of 60 days from fiscal year to fiscal year. (Note: Exceptions can be approved if one can show that they were denied leave due to military necessity for unusual situations, such as long-term deployments). In other words, if you have 65 days of leave on the books on 30 September, 5 of those days will be lost when the calendar rolls over to 1 October. Leave can be sold back at the time of reenlistment and separation/retirement. For each day of leave you have saved, you can sell it back for one day's base pay (taxable). One can only sell back a maximum of 60 days of leave during a career. It does not have to be all at one time. For example, one could sell back ten days of leave during their first re-enlistment, then ten days during their next re-enlistment. Terminal Leave: Instead of selling leave upon your discharge, one can take "terminal leave" when they are discharged or retire. For example, let's say you are scheduled to be discharged (or retired) on 1 September, and you have 30 days of leave. You can out process from the military 30 days early, then continue to receive full pay (including base pay, housing allowance, food allowance, and any special pays), until your official date of discharge. Liberty Pass: A "pass" is non-chargeable time-off also known as “liberty.” During a military member's normal off-duty time, they are automatically considered to be on a "Regular Pass." With a few exceptions (such as basic training, or phase restrictions in technical school), a military person can leave the base when off-duty without special permission. Another type of pass is a "special pass." An example would be the 3-day pass. These are special passes issued by the commander, first sergeant, or (sometimes) supervisor for "time off," often given as a reward for superior performance. Usually, a special pass cannot be used "back-to-back" with leave, and cannot (in most cases) be used in conjunction with a weekend or other scheduled off-duty time. Permissive Temporary Duty Assignment (PTDY): Sometimes a military member wants to attend a conference, class, or function that the military won't pay for, but which benefits the individual professionally (which thereby benefits the military). In such cases, the commander can authorize a Permissive TDY. Members on Permissive TDY do not receive any travel pay or reimbursement (like they would for an official TDY) but isn't charged against their leave. In general, if your classes last longer than 20 weeks (at a single location), dependents are authorized to travel to the school location and set up a household at government expense (see First Duty Station Travel Entitlements, below). If the length of the classes is less than 20 weeks, government reimbursed transportation is not authorized, in most cases. However, dependents are certainly allowed to relocate, on their own, at their own expense. In either case, members in job school receive a housing allowance, based upon the actual location of their dependents. It's important to remember that (except for the Marines), leave is not usually authorized following basic training. This means the dependents would have to make the move completely on their own, without the member's presence. However, if they are going to be a "military family," this is something they should get used to. Additionally, the member is probably going to be restricted to base during the first part of their training (usually, the first 30 days or so), so the dependents may have to do all the "house-hunting," to find a place to live. Travel Pay: When you graduate technical school/AIT/A-school, the military will pay the authorized costs for you to go from your technical school/AIT/A-school location to your next duty assignment (or, to the "port" of your military flight for overseas assignments). 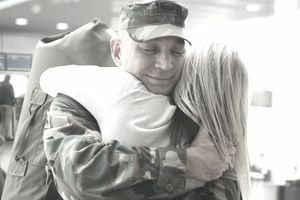 There are two ways that the military will do this (your choice): they will either provide you with an airline ticket for a flight directly from your school location to the next duty assignment (or port call), or they will pay you a mileage allowance plus per diem for each day you are in an authorized travel status. Air Travel: Suppose you leave Base X, buy a ticket home for $800, then buy a ticket from home to Base Y for $300 (for a total expenditure of $1,100)? In that case, the military will pay you what it would have cost THEM to buy you an airline ticket directly from Base X to Base Y. Let's assume that they would have paid $900.00. In this case, you would be reimbursed $900, out of your total $1,100 expenditure. If you travel overseas for a tour, the military will either ship or store your vehicle for you at no cost depending on the location of your PCS move.